Forty-one alumni work at Community Memorial Hospital in Cloquet. 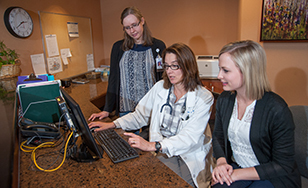 Community Memorial Hospital (CMH) of Cloquet is a good example of St. Scholastica's positive impact. It employs 41 Saints in positions ranging from senior administration to therapists, health information management professionals, and more. Marilyn Sorenson '94, '02, senior vice president of hospital and clinical operations, admires how her alma mater adapts its programs to match employment trends. "The College prepares highly qualified graduates," she said. "Their attributes of personal accountability, drive to achieve, ability to adapt and commitment to serve are highly valued and recognized by employers everywhere." Meet a few of the Saints who are living out that "St. Scholastica difference" at CMH in Cloquet. For Michael Barrett, the journey to becoming a physical therapist began when he broke his ankle in youth soccer. The injury required therapy and gave him his first exposure to the profession. From that day forward, he never veered off the path to becoming a physical therapist. "I knew St. Scholastica had a great physical therapy program and I thought it would be a good fit for me in terms of class size and being close to home. All the professors were very knowledgeable and they genuinely wanted me to succeed. I could tell they really cared and wanted me to be the very best physical therapist possible." Barrett applied for the physical therapist position at CMH a month before he graduated and was offered the job before he received his diploma with the stipulation that he pass his PT licensing exam. "I think the College's emphasis on professionalism really helped me get the job and excel as a physical therapist," he said. Kiaja Earlywine knew she wanted to go to St. Scholastica from an early age. Her mom, grandmother and three aunts were alumni and she heard many positive things about their experiences. "When I visited the campus as a high school senior, my tour guide was an HIM major. Hearing her talk about it made me realize it might be a fit for me," said Earlywine. "I loved all the faculty and the small class sizes." She returned to St. Scholastica to get her M.S. in Health Informatics in 2016. "One of my instructors, Brooke Palkie, actually helped me decide on the master's program. She knows me so well, she helped me see my strengths and pointed me in the right direction." Earlywine was hired as a Clinical Informaticist at CMH in February 2016. She credits the St. Scholastica program and faculty for helping her land the job. "It's great for hospitals in this area and beyond that CSS is producing such well-rounded workforce-ready graduates." Growing up in Carlton, MN, Cory Saarela knew he wanted a career in the medical field, he wanted to go to a small college, and he wanted to stay close to home. St. Scholastica's nursing program was the perfect fit. "The nursing school seemed to have a very professional approach," said Saarela. "They pushed us to become leaders in the field of nursing. After 20 years in the field, I see a lot of graduates in leadership roles, so it turned out to be true." It turned out to be true for Saarela, as well. After graduating, he found his way to Essentia Health in Duluth and became an administrative representative after working as a charge nurse. He enjoyed it, but found he missed the hands-on aspects of nursing and the variety of experiences that a smaller hospital offers. When the job for a nurse supervisor opened at CMH in Cloquet, he jumped at the opportunity. Dr. Jeff Rapp began his undergraduate college experience a little later than some. He went to work after graduating from high school and at age 27, with his wife expecting their first child, he says he knew it was time to get a degree. "My experience at St. Scholastica was wonderful. As a nontraditional student, I don't think I would have made it if I'd gone to a bigger school," said Rapp. "My classes were small and very personalized. The faculty were excellent and they always had an open door policy." Rapp recalls how instructors like Dr. Gerald Cizadlo and Sister Agnes Alich made subjects like anatomy and chemistry come alive. "Sister Agnes was wonderful in giving me guidance, help and support," he said. After St. Scholastica, he went on to medical school at UMD. He went on to join the medical staff at Cloquet. "The College has a lot of relationships with area hospitals and employers know that CSS has good programs," he said. With a new Physician Assistant program beginning this fall, expansion of the Physical Therapy program, and a School of Nursing that's grown to the second-largest in the state, the chances of encountering a St. Scholastica Saint in the healthcare sector continue to grow. That's good news for patients and hospitals like CMH of Cloquet.